Quickspin takes you on an adventure to Shangri-La, a mysterious place in the Kunlun Mountains, Tibet, with their video slot Hidden Valley. Originally launched in 2015, the slot tells the story of two travellers who have found the secret entrance to the Valley and they are ready to discover it with their Sherpa. The main symbols in the game are the two travellers, a male and female, Sherpa, the bald eagle and yak. The reels are set against a beautiful landscape, so stay with us to learn how to join the travellers and help them reach the Hidden Valley. Quickspin is a relatively young Sweden-based software developer. Founded in 2011 by a group of passionate slot enthusiasts, the company has already established itself on the market by providing top-notch video slots gamblers love to play thanks to innovative bonus features and engaging visuals and sounds. The award-winning developer operates as a part of the Playtech group since 2016. Hidden Valley features an unorthodox layout with 5 reels and a 3x4x4x4x3 row structure. It offers 40 paylines and uses a standard control panel allowing you to choose your total stake. It can be anywhere between $0.40 and $40 per spin, but if you want to benefit from up to 10x multipliers, you can increase your bet up to $120 per spin. On the right-hand side of the reels you will find all the additional bets options and select a preferred one easily. Once you have set your stake, push the Spin button or activate up to 1,000 automatic spins that will play without interruption. 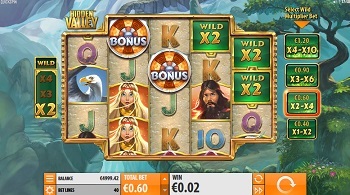 The slot machine looks good on both desktop and mobile devices with nicely drawn graphics accompanied with engaging sounds. As you would expect from a Quickspin title, it performs smoothly regardless of the platform or device you choose, allowing you to enjoy an immersive gaming experience. The only downside to it may be playing card icons that make up the lower ends of the paytable. We have already mentioned multipliers you can increase up to 10x by playing additional bets. Thanks to this option, you can add Multiplier Wilds to each spin at a certain cost. 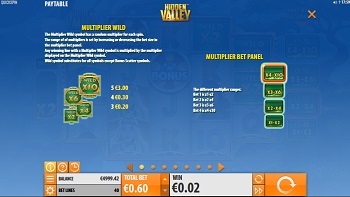 When playing the game at a regular bet, you will benefit from Wilds equipped with a 1x to 2x multiplier. If you choose a Wild Multiplier Bet worth 1.5x your regular bet, Wild with 2x to 4x multipliers will complete your winning combinations. The next additional bet adds 3x to 6x Wilds to the reels while the most expensive bet worth 3x your regular stake grants Wilds with multipliers ranging between 4x and 10x. A multiplier will be chosen at random on each spin and Wilds appear in stacks to help you complete multiple winning combinations at once. 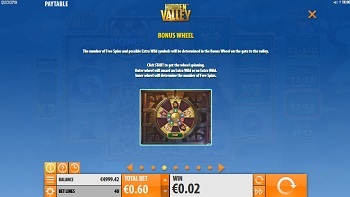 Wheel Bonus Scatters appear only on the three central reels and once you land three of these, you will unlock the Free Spins feature taking you to the gate of the valley. Your prize will be determined by spinning the Bonus Wheel and it includes free games and extra Wilds. While playing free spins, one of character symbols can be turned into extra Wilds to substitute for all symbols bar Multiplier Wilds and Bonus Scatters. 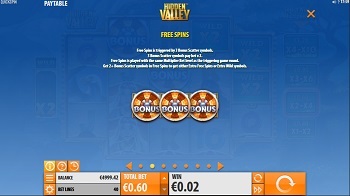 By landing 2 or more Bonus Scatters within the feature, you can earn extra free spins or extra Wilds. The top paying symbol is Multiplier Wild that creates winning combinations on its own and awards 7.5x your total bet for 5 of a kind combination. Five male explorer symbols grant a payout of 1.25x your bet while the same combination of female explorer symbols pays only 1x. The payouts may seem low but thanks to 40 paylines and Multiplier Wilds, you can hit some hefty prizes. This is a slot game of low to medium volatility with a solid RTP of 96.47%. Quickspin has made their popular game revamped providing players with more polished visuals and opportunity to enjoy it on mobile devices too. 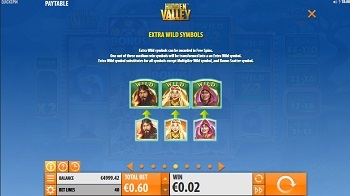 Whether you prefer playing slot machine from the comfort of your home or on the go, consider giving Hidden Valley a try for a chance to enjoy a relaxing gaming experience and win big thanks to loads of Wilds boosting your odds throughout the game.